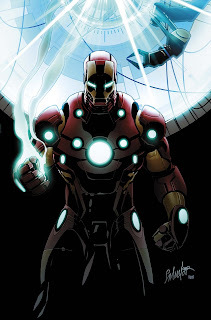 When an enemy of Spider-Man takes on Tony Stark, what does a clash of geniuses look like? It looks pretty fun. In this issue Matt Fraction has some more great dialogue, advances the plot about Tony Starks plans to make repulsor-powered technology, and has some great scenes between he and Dr. Octopus. It seems the ol' doc and he go way back (as shown in some well illustrated scenes by Salvador Larroca, who is able to alter his drawing style well throughout the comic for both scenes in the past and present), and they don't exactly get along. 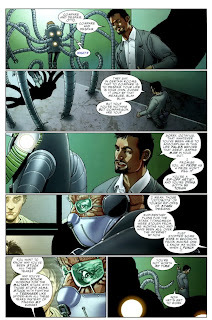 This causes the evil doctor to challenge Stark to fix his terminal illness or simply admit he can't do anything--with either option resulting in Dr. Octopus disabling a huge bomb and letting a friend being held hostage go. I like the twist that for Stark to assure everyone's safety he only has to admit he can't do anything, but with his ego he can't help but try and cure our villain of his almost certain death. 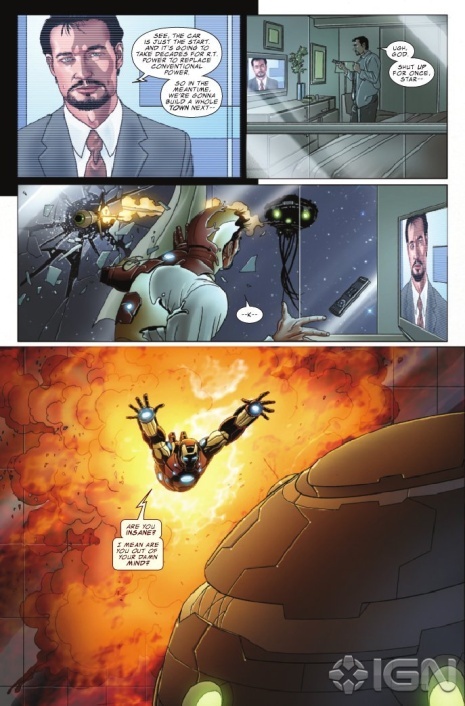 It shows how Stark is both smart and full of himself. This issue has a little action, but is mostly scenes of people talking, be it Tony interacting with television hosts or doctor Octopus. This isn't a bad thing though, because Faction writes some great lines such as, "I know my work when I punch it," along with other gems. There isn't anything too spectacular in this issue, but Fraction usually follows a routine in this series of starting out quiet and slowly building up to a fantastic climax before cooling things down a bit and starting the whole cycle over. Therefore, I'm not worried that this issue feels a bit mellow because I know things are going to get crazy soon enough. Invincible Iron Man always impresses and the start of this storyline appears to be setting us up for some interesting events. I'd recommend this series as always, even if this issue itself is enjoyable but not amazing.